Considering doing your first Triathlon? Are you interested in triathlon but not sure where to start? You have a list of questions including what gear do I need or how do I train? The Cleveland Tri Club with the help of A.J. 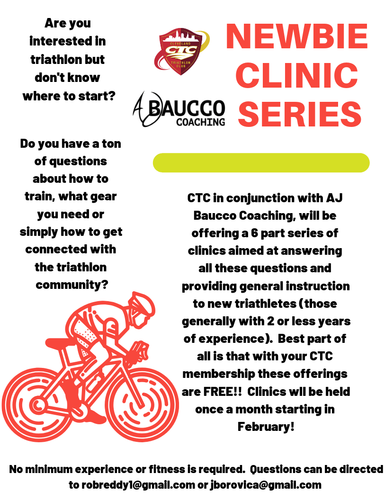 Baucco Coaching has created a 6 part series that kicks off with an Introduction to Triathlon. This initial meeting we'll cover everything from basic gear needed to getting started on a training plan. We'll wrap up with a question and answer forum. The remaining five programs will be broken down by disciplines and include instruction, practice and Q&A. This program is geared towards beginner triathletes with less than 2 years experience.